We all know to duck for cover in a basement or other secure location when we're at home and a tornado strikes. However, if you happen to be traveling or are on your way home from work and you're caught in the midst of it, knowing what direction tornadoes usually move could help save your life. 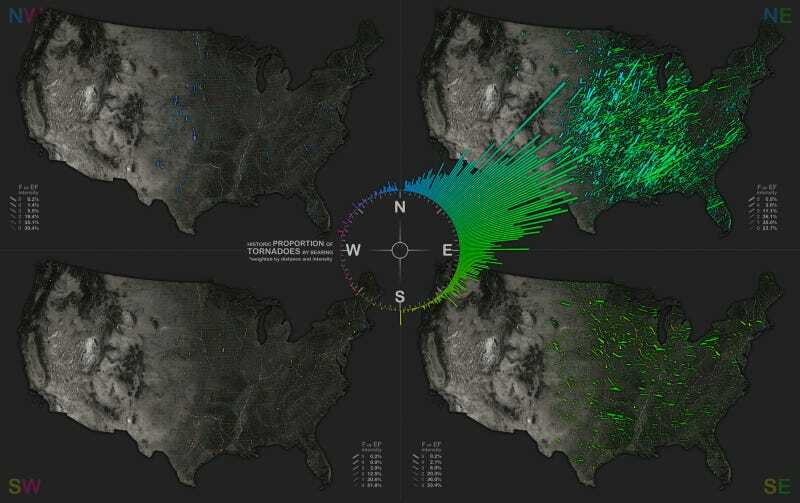 I got this post idea from data visualization expert John Nelson, who posted on his blog the direction in which tornadoes have traveled over the last 63 years. From the data, he discovered that a majority of the tornadoes moved in a northeastern direction, with a handful of them moving east. Knowing this, you have an advantage as far as what direction a tornado will go if you get caught up in the midst of one, and you can drive in a different direction away from the tornado to avoid it. You can also use this information to know if a tornado touchdown nearby will end up coming your direction so that you can take cover before it's too late. Of course, be sure to read Lifehacker's complete guide on what to do when these kinds of disasters strike. When tornados strike, which way do they travel?